[Desmond Flower.] Three Autograph Catalogues of his book collections: first, 'MSS., autograph letters, first & early editions by & relating to François Marie Arouet de Voltaire'; second and third, 'French Literature in first and early editions'. All three items in very good condition, in superior bindings. ONE (Voltaire catalogue): Written out by Flower in his neat, calligraphic hand, on the rectos only of 102 leaves, 8vo, with some blanks. In very good condition, in a lightly-wrn red morocco quarter binding, with grey boards and gilt title on spine. Entries are short and businesslike, as the following two examples indicate: 'Commentaire sur le livre des Délits et des Peines, s.l., 1766. Bengesco 1724. pp. viii + 120. A pretty copy in contemporary scarlet morocco. Ex libris Mortimer L. Schiff. | Ditto, s.l., 1766. pp. 104 + iii. 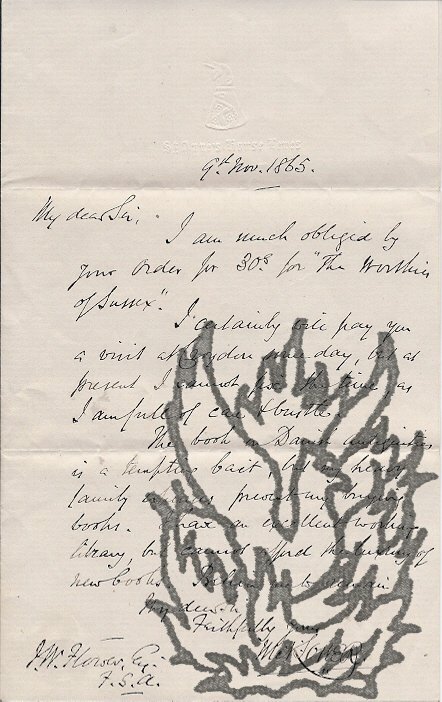 Autograph Letter Signed ('F Barham Zincke') from the antiquary and radical Foster Barham Zincke to 'My dear Mr Flower' [Sir William Henry Flower], regarding the latter's five-month stay in Egypt. Wherstead Vicarage, Ipswich. 28 May <1874?>. 4pp., 12mo. Very good, on lightly-aged paper, with minor traces of stub adhering to margin. He has received Flower's 'catalogue'. 'I was sure you wd. be delighted with Egypt. It has so much to tell us about man & nature. The early stages of mans progress, & the variety of nature.' Zincke would like 'time to look into things & to think about them': he was in Egypt 'only as many weeks as you were months'. 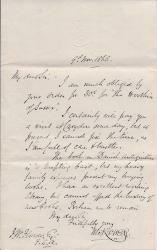 Two Autograph Letters signed from the Sussex antiquary Mark Antony Lower (both signed 'M: A: Lower') to John Wickham Flower. 27 April and 9 November 1865; on letterheads of St Anne's House, Lewes, Sussex. Both items in good condition, on lightly-aged paper. Letter One (27 April 1865): 12mo, 2 pp. Bifolium. Seventeen lines. He is sorry not to have been able to accept Flower's hospitality: 'Let us hope to meet about Whitsuntide for the pilgrimage to Firle'. He is eager for information for his 'Sussex Worthies'. 'My eldest dau[ghte]r's marriage & the starting of my eldest son on his professional career cost money, & every 30s. [subscription) will help.' Letter Two (9 November 1865): 12mo, 1 p. 13 lines. He has received the 30s.